This is the largest order of insects with over 300,000 species worldwide and contains some of the heaviest of all insects (the fist sized Goliath Beetle weighs in at 100g) – and also some of the smallest with many less than 0.5mm long. 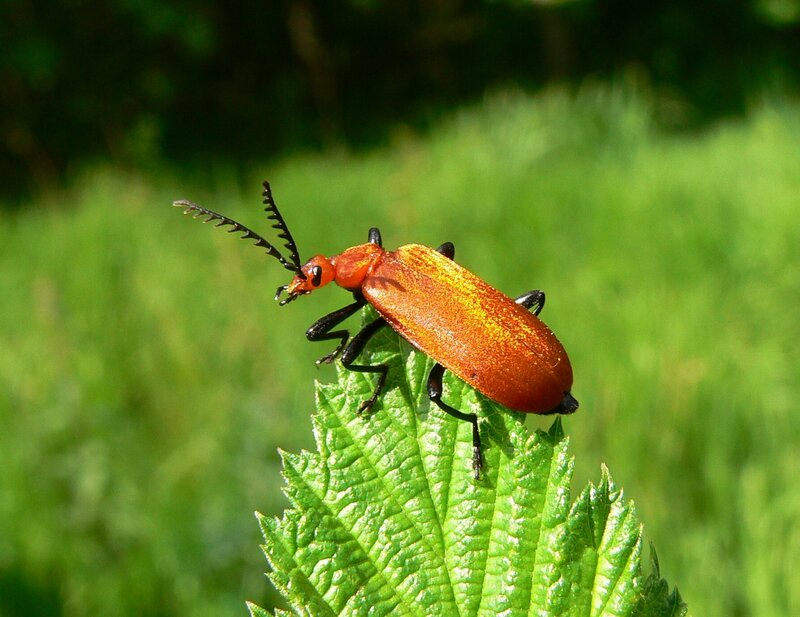 About 4000 beetle species live in the UK. The front of a beetle’s thorax is covered by a tough, often highly ornamented shield called the pronotum. 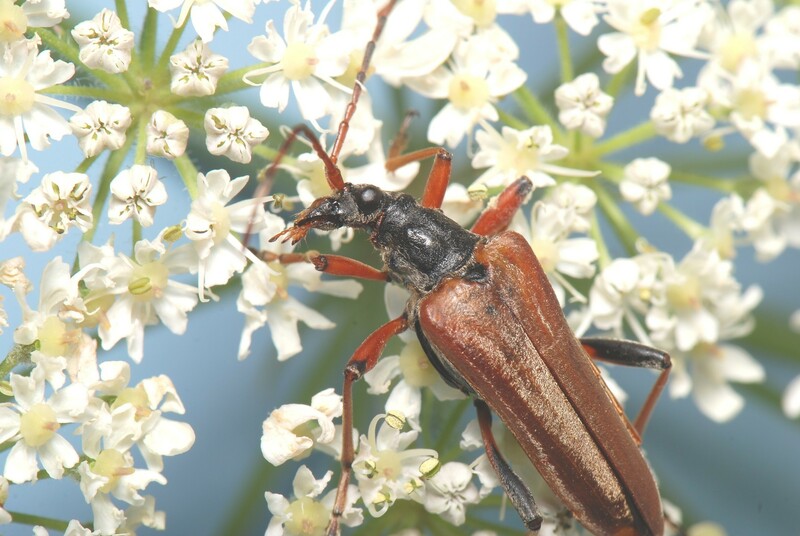 Behind this, beetles forewings are hardened to become protective coverings called elytra giving beetles their armoured appearance The elyta cover the rear of the thorax and the hindwings (if present) and usually also the abdomen. Rove beetles’ abdomens are not covered by the elytra…. 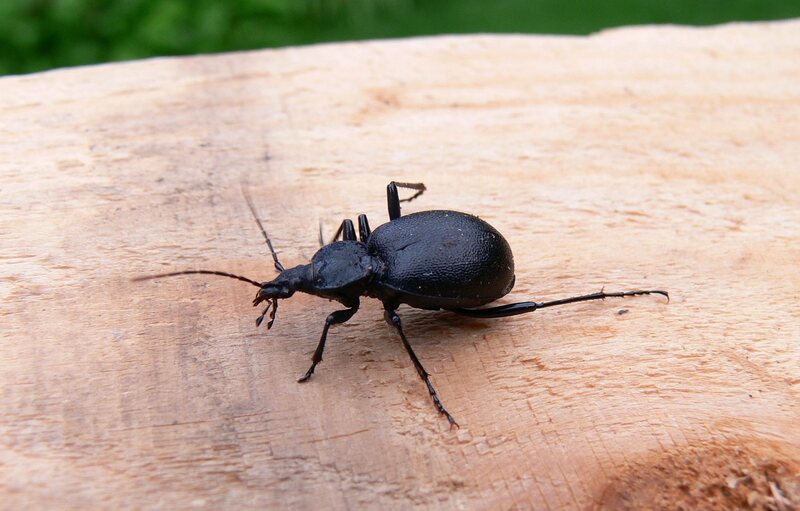 see the photo of the Devil’s Coach Horse. Most beetles can fly and use their hindwings to achieve this. The hindwings are folded under the elytra when not in use. Wings are absent in a few species in which case the elytra may be fused together to provide added protection. One such beetle is Cychrus caraboides. 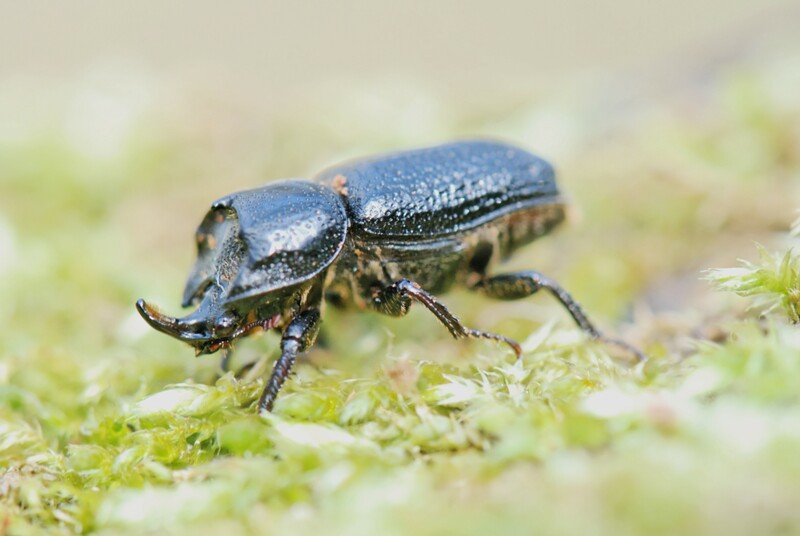 Beetles have compound eyes and with their biting jaws both the larva and the adult can exist on solid food ranging from dry bone and wood to juicy roots, stems and fruits. The ability to exploit such a wide range of foods is one of the main factors that have made beetles such a success throughout the world. 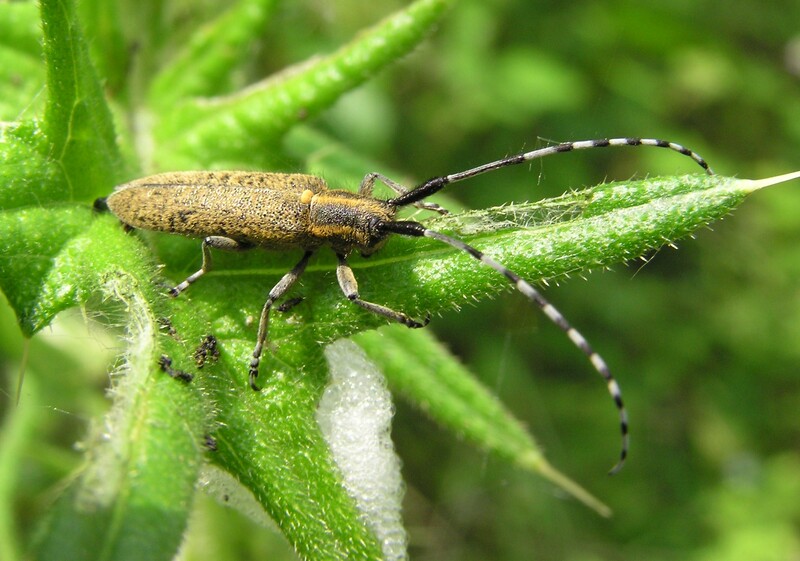 Agapanthia villosoviridescens is a locally uncommon longhorn beetle. The first specimen for the parish was found in June 2012 on the outskirts of the wood and was then only the third record for VC64. Cockchafer; Melolontha melolontha. 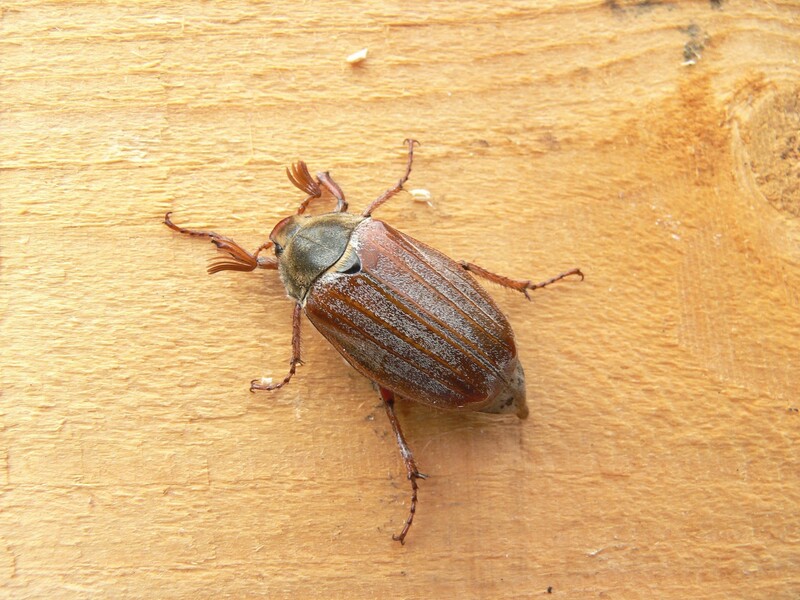 These are particularly numerous around May-time and are a favourite of Noctule bats which can be heard crunching the beetles after catching them on the wing. 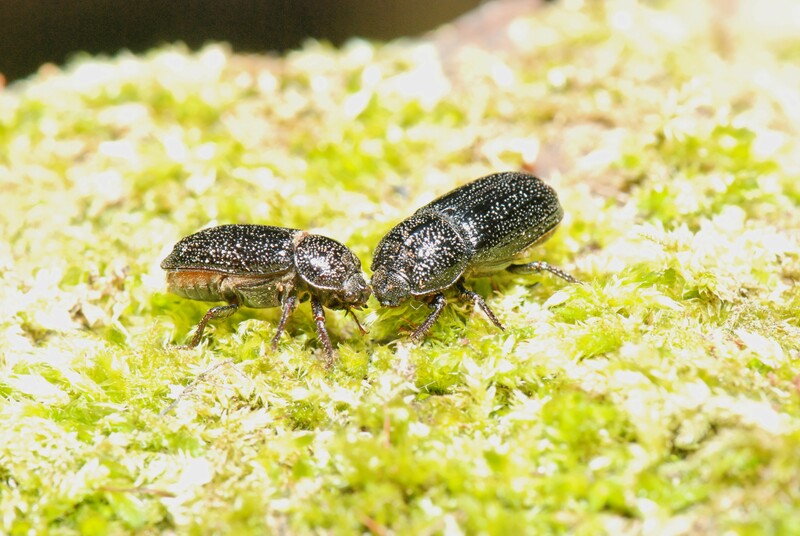 Cychrus caraboides is a snail eating beetle. Its head and pronotum are narrowed so that it can get into snails’ shells. Its elytra are fused which better protects its body but means that it can no longer fly. 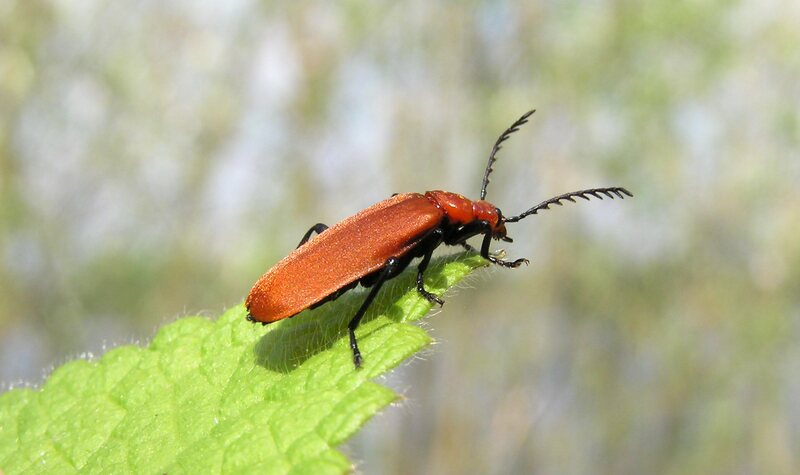 Pyrochroa serraticornis: The Cardinal Beetle can be seen flying around the wood’s clearings on sunny days in May. Platyrhinus resinosus. 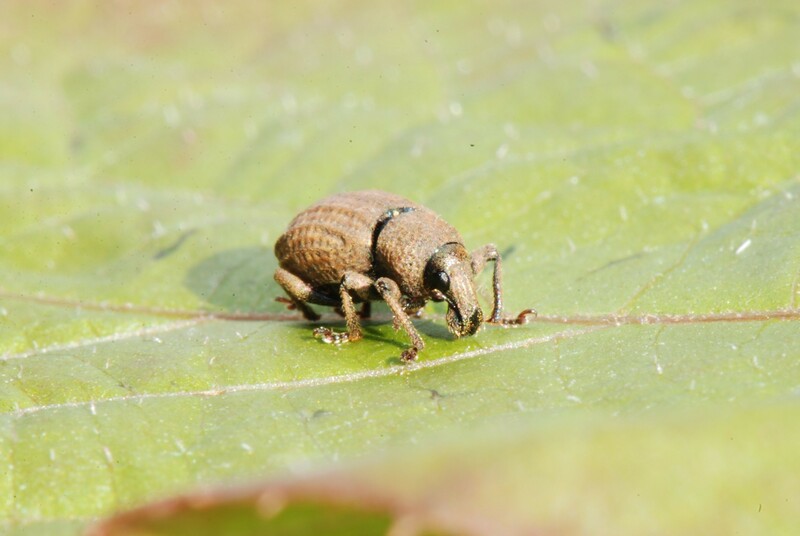 Larvae feed on the fungus Daldinia concentrica hence the common name of Cramp Ball Fungus Weevil. Female Sinodendron cylindricum. 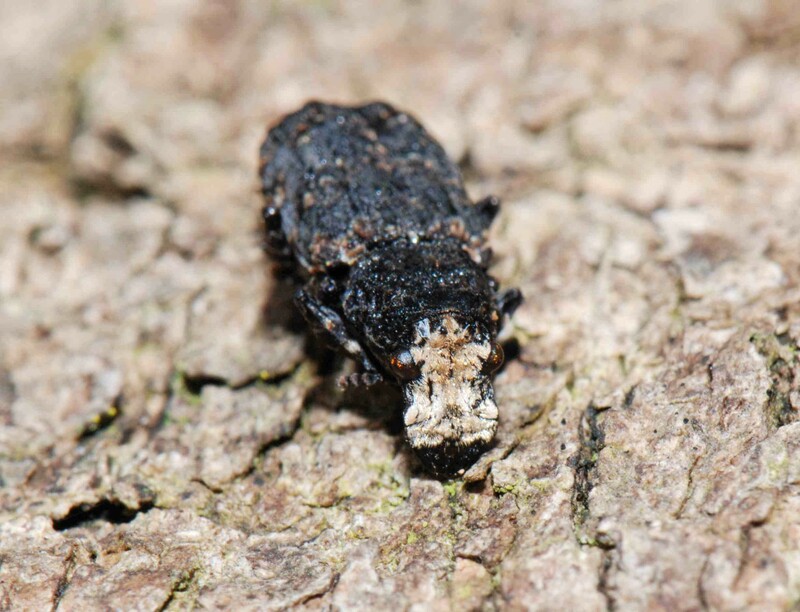 Larvae feed on dead hardwood… Ash and Birch. The species is an indicator of ancient woodland. Barynotus moerens is a type weevil. 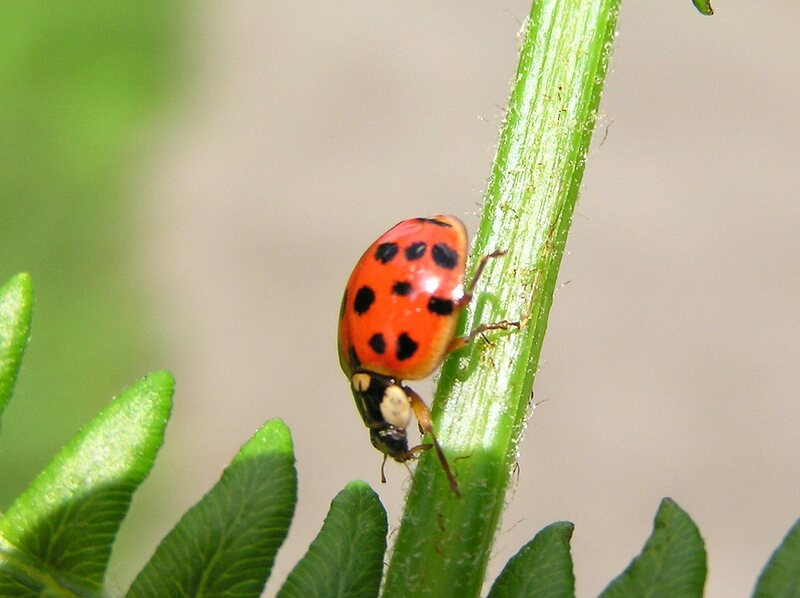 Anatis ocellata, the Eyed Ladybird is Britain’s largest ladybird. Chilocorus renipustulatus. 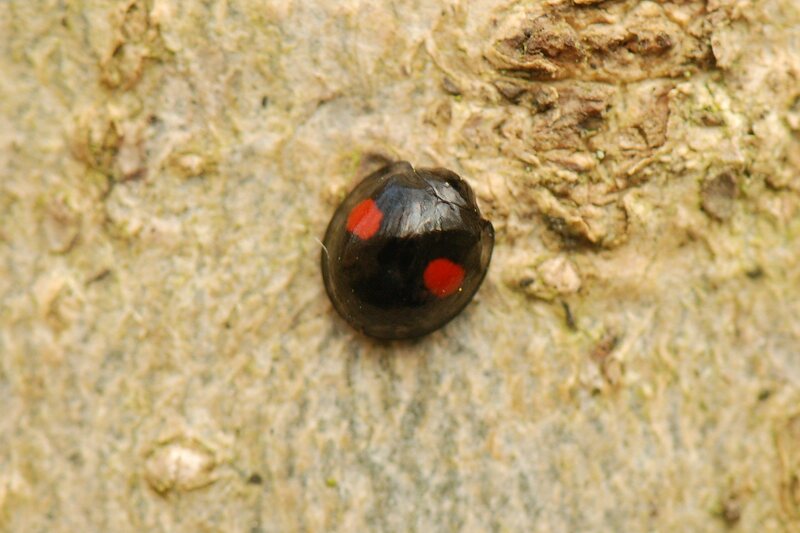 The Kidney-spot Ladybird is a small ladybird at about 4mm, very domed, and is found on tree trunks and branches. Ox Close is about the northern-most limit of its range. 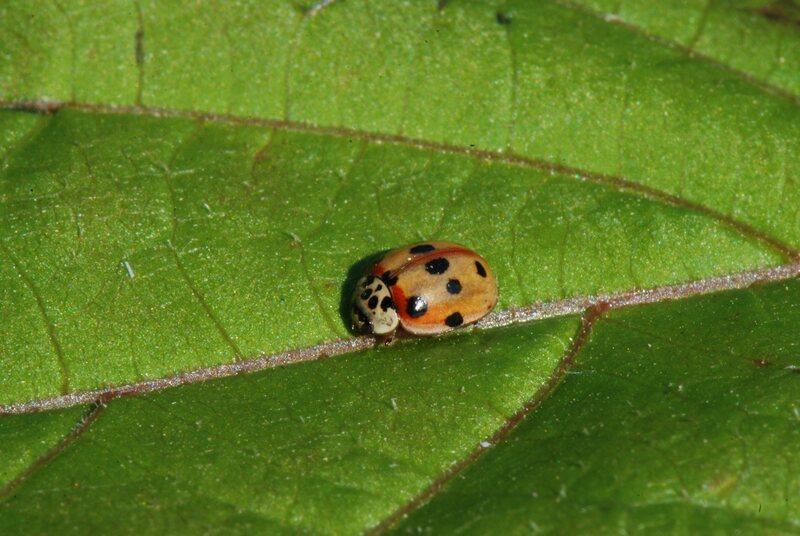 The Seven-spot Ladybird Coccinella septempunctata is common everywhere. Here, a group is hibernating on a twig. 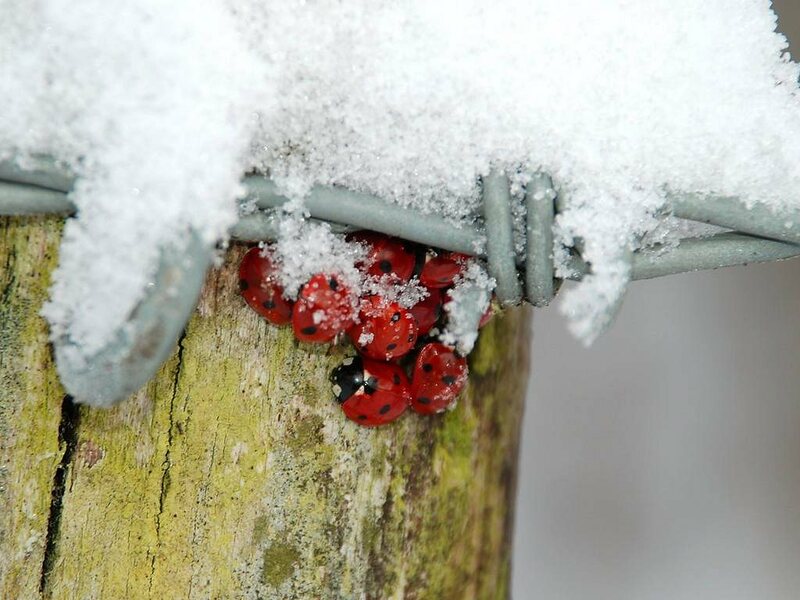 7 spot Ladybirds hibernating on a snowy fence post. The temperature was -3’C. 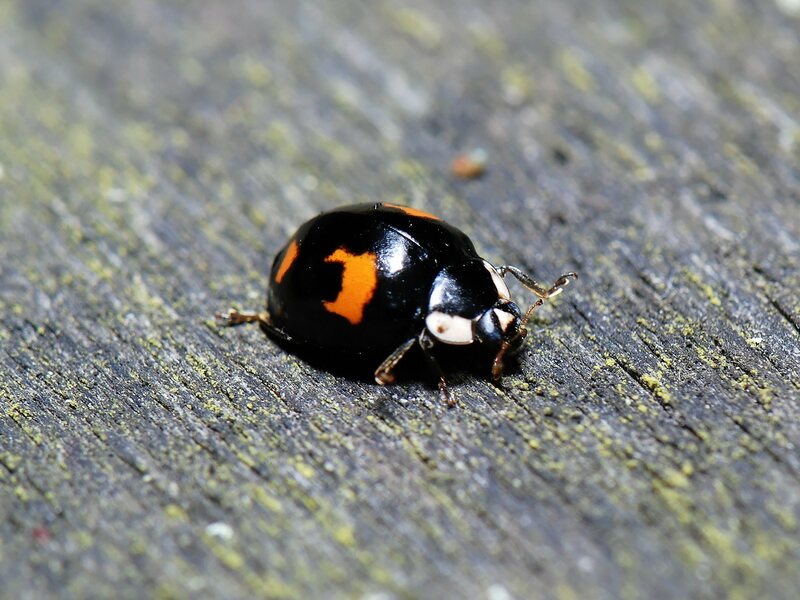 Orange Ladybird The Orange Ladybird, Halyzia sedecimguttata, used to be considered as an indicator of ancient woodland but has become widespread during the last 20 years as it is now commonly associated with sycamore trees. Orange Ladybird: Another photo of a group Halyzia sedecimguttata hibernating in the branch node of an Ash sapling. Over 100 have been found at once in groups of 5 to 30. 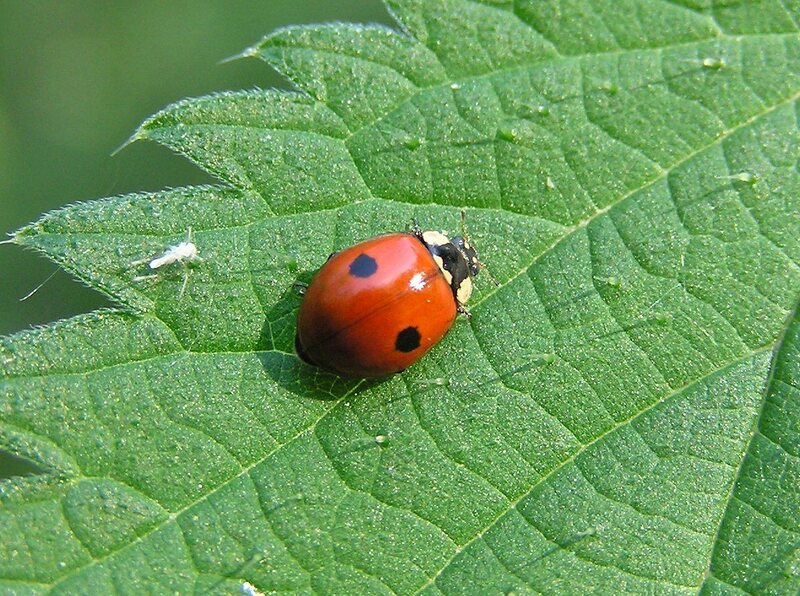 The 14-spot ladybird, Propylaea quatuordecimpunctata, is another aphid eater and can regularly seen hunting on brambles. 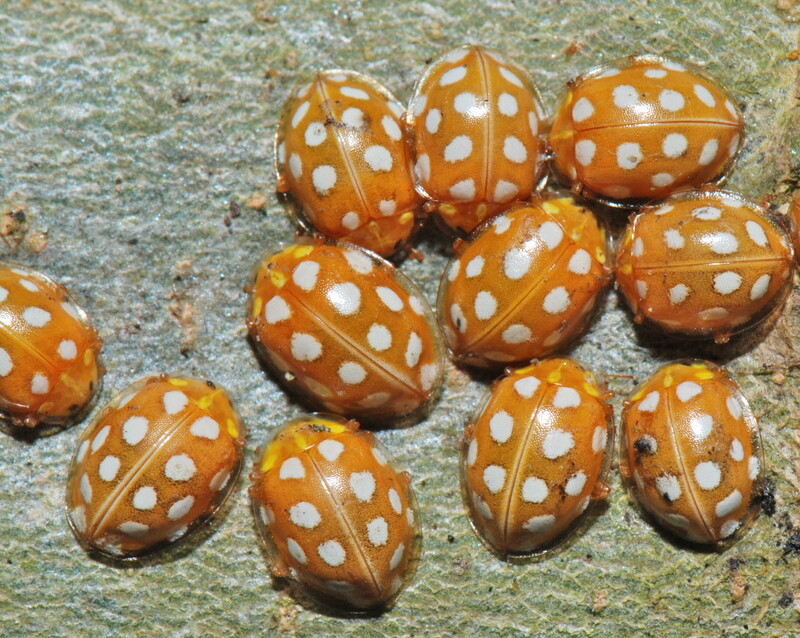 There are a number of colour forms of Harmonia axyridis. This is the form spectablis. Colour forms include – but are not restricted to – red on black, black on red, yellow on black and black on orange. They have brown legs and the white areas on the sides of the pronotum extend all the way back. 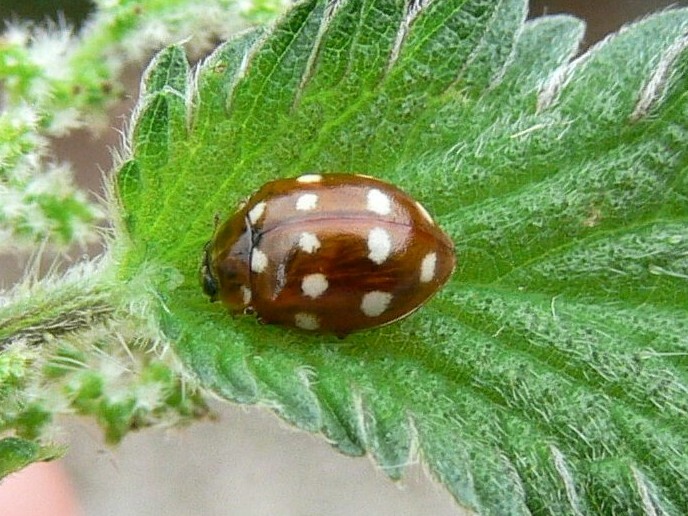 On the 7-spot ladybird the white areas go only half way back. 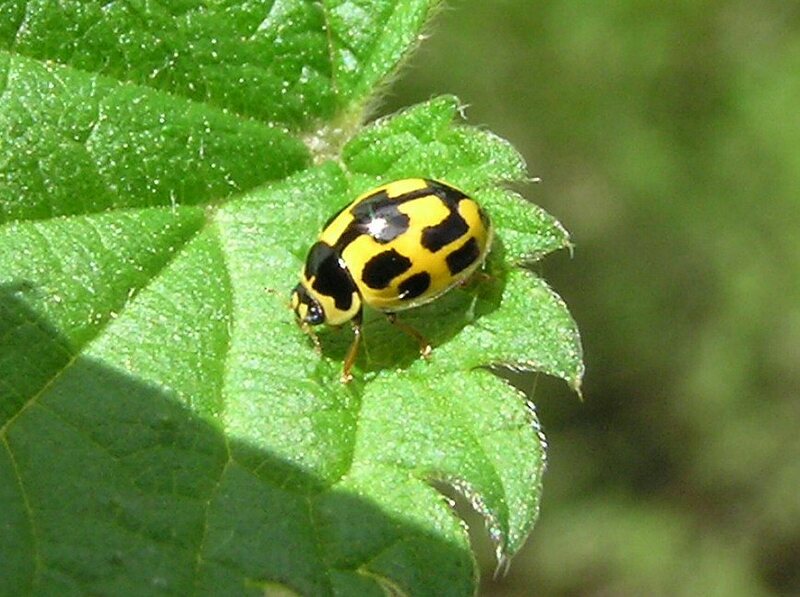 The Harlequin Harmonia axyridis was introduced into Europe from Asia in the early 1980s as a form of pest control. 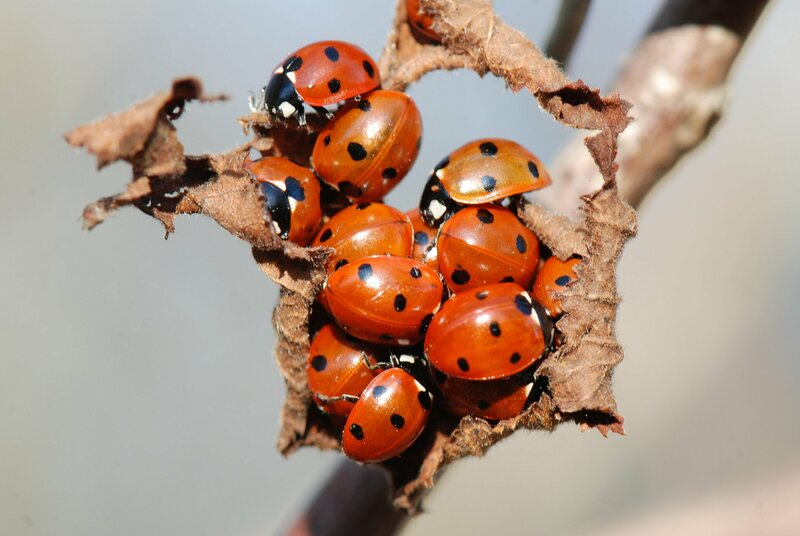 Unfortunately as well as aphids it also eats native ladybird species as well as the eggs and larvae of butterflies and beetles and is a pest to humans as it hibernates in buildings sometimes in huge numbers. It was first found in the wood in mid-October 2009. 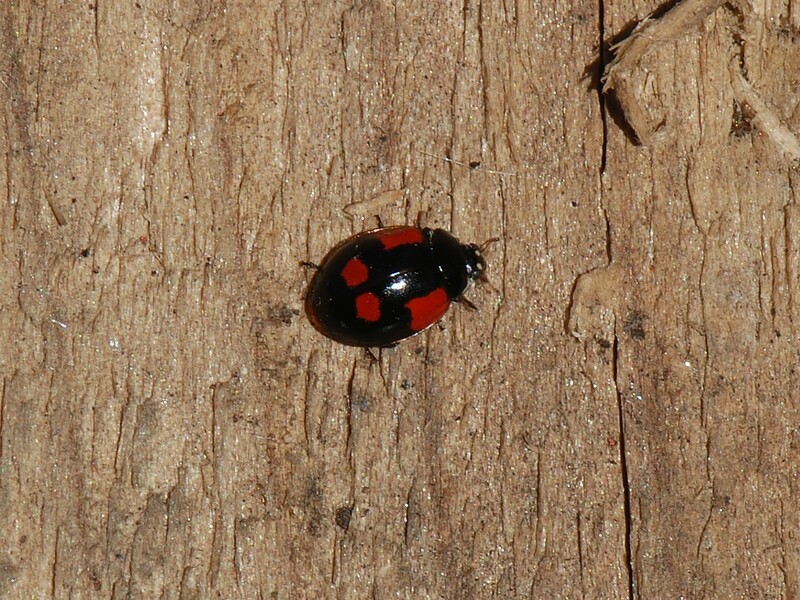 The Harlequin ladybird Harmonia axiridis. Originally Asian, it was introduced into America as a form of pest control in the early 1900s but did not become well established there until the 1980s. 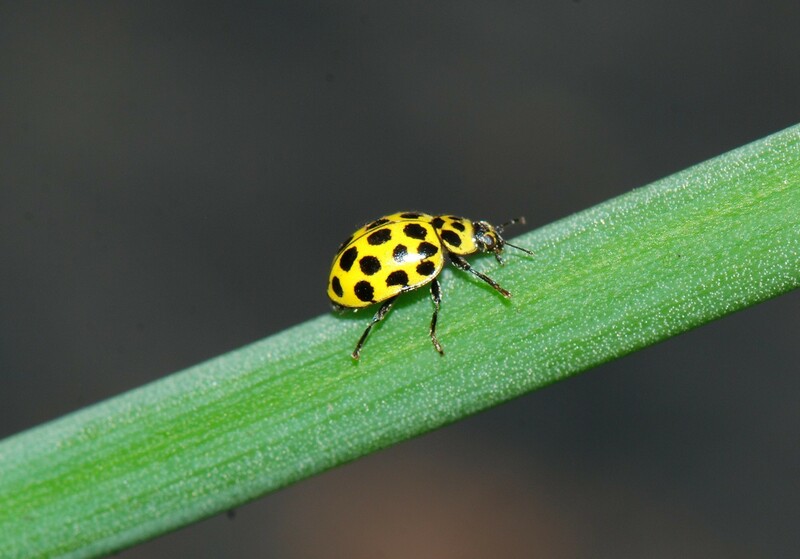 Unfortunately, the problems caused by the Harlequin were not widely known until after the Harlequin was also introduced into a number of European countries; again as a biological control. It is regarded as a human nuisance; it hibernates in aggregations in buildings – thousands have been reported. It is a grape and vine pest, also eating other fruits. It is a threat to native species. 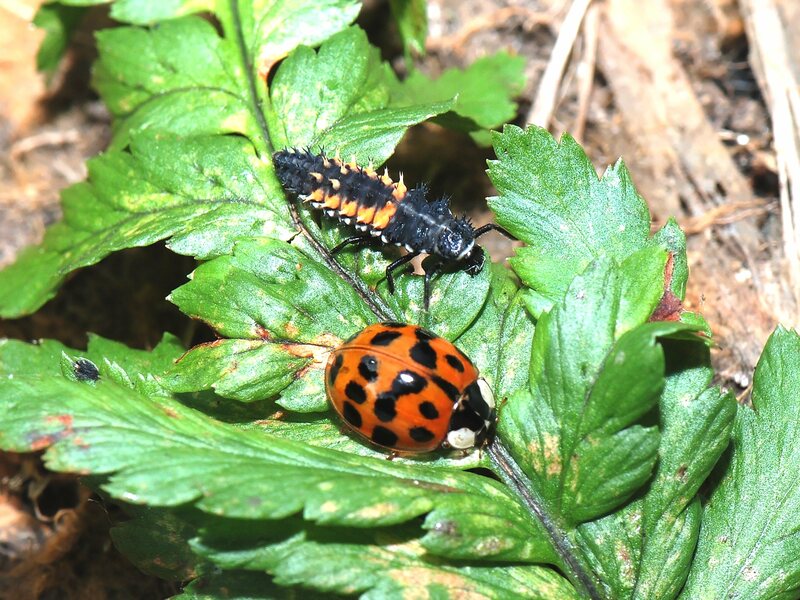 It adds to its diet by eating other native ladybird larvae along with the eggs and larvae of beetles and butterflies. Inevitably it found its way into the UK. It was first recorded in England in 2004, and reached Scotland in 2007. It is regularly encountered in Ox Close. How can you tell if you’ve found a Harlequin? Unfortunately the Harlequin is very variable in colouration and this can make it very difficult to tell apart from our some of our native species. The elytra can be yellow/orange, orange/red, red or black with 0 to 21 spots arranged in a grid pattern. 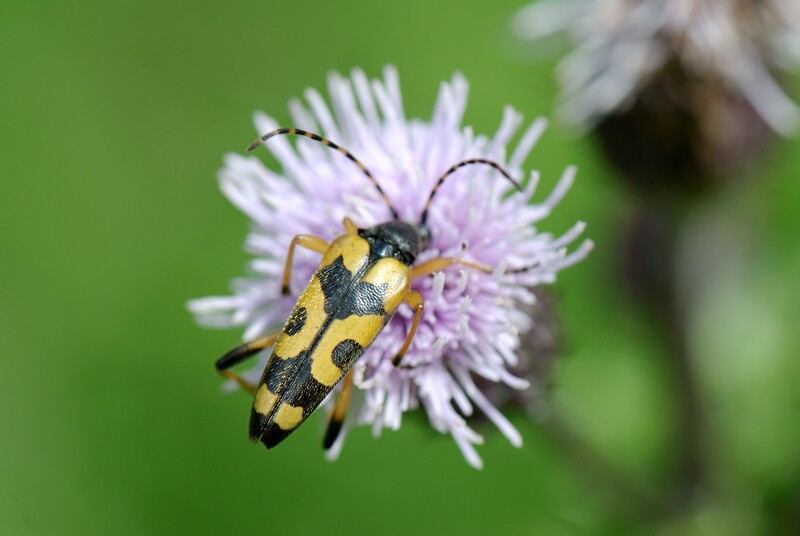 If it is less than 5-6mm long then it is not a Harlequin. 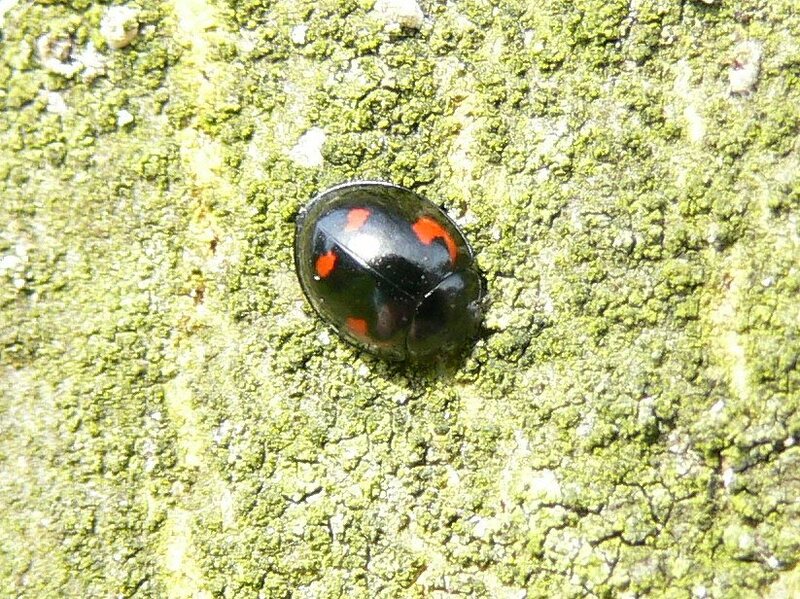 If it is red with exactly 7 black spots then it is a 7-spot. 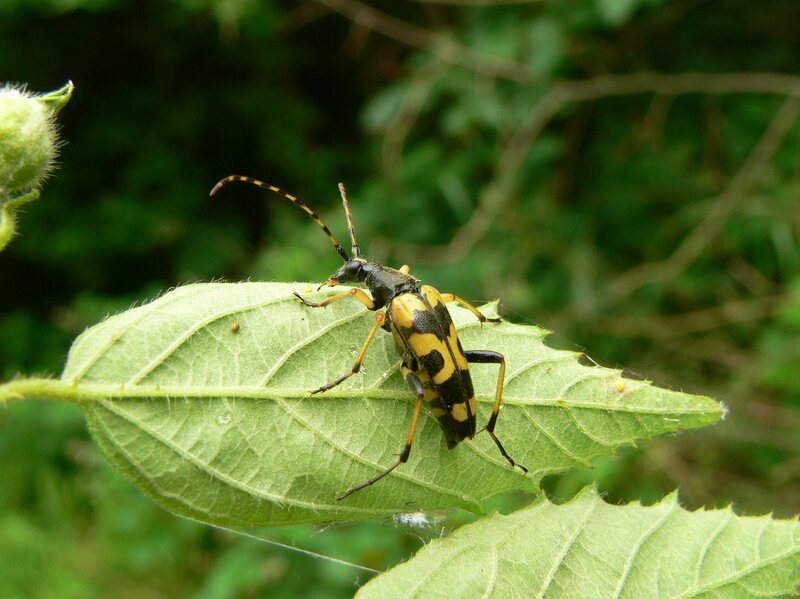 If the white patches at the sides of the pronotum (thoracic area) extend all the way to the back of the pronotum then it could be a Harlequin. 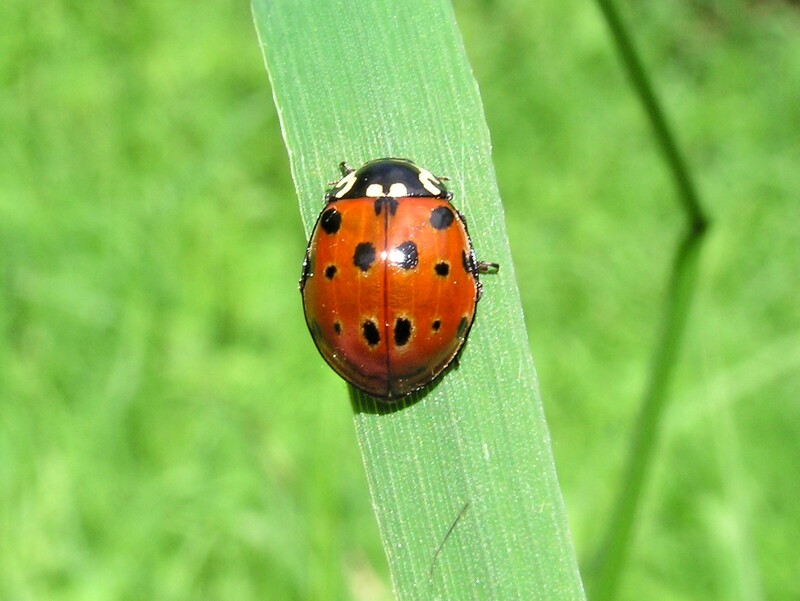 The white areas of a 7-spot extend approximately only half way back. 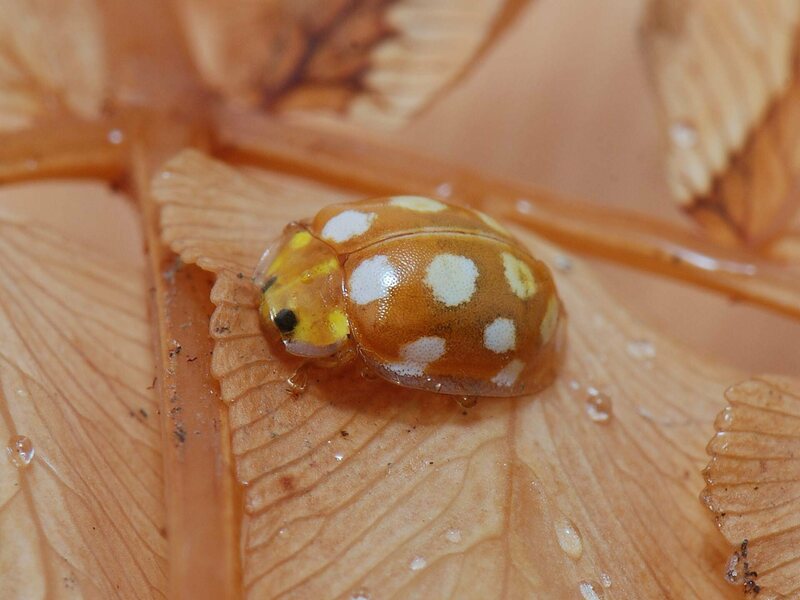 The white pronotum patches of the Eyed and 2-spot extend to the rear but the Eyed has a pale ring around each of its 15 black spots and the 2-spot is much smaller… less than 6mm long.